There's the truth, and then there's "the truth." There's a lot to like about the Samsung Galaxy S4, but the phone's storage capacity isn't all it's cracked up to be, and one BBC show is calling out the South Korean manufacturer. At contention is the fact that the 16GB version of the smartphone will leave its users with approximately 9GB, nearly half of the space advertised on the box. "Samsung - it claims its brand-new Galaxy phone has an extra large memory. What did it forget to mention?" teases Anne Robinson at the end of this week's Watchdog episode on BBC One. Robinson, the Watchdog anchor and former host of The Weakest Link, will examine the Galaxy S4's storage - or lack thereof - on Wednesday, May 15 at 8 p.m. GMT. 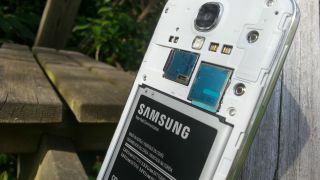 When TechRadar investigated the phone's internal media, more than 6GB of system files took up the entry level Galaxy S4's 16GB of storage even before it powered up for the first time. Samsung's solution? Buy a MicroSD memory card, which can add up to 64GB of extra space to the smartphone. Great. But as the BBC One show is likely to point out next week, apps cannot be stored on this external memory card. This is going to force users to limit how many heavy-duty programs they'll be able to use on their Android phone. The deceptive amount of space that Samsung Galaxy S4 comes with out of the box is a growing trend among smartphones and tablets. Microsoft, most notably, faced criticism when launching its Surface Pro tablet, which advertises 64GB of free space. In reality, the base model of the Surface Pro only has 23GB of storage open to users thanks to the fact that it runs the Windows 8 Pro operating system. A better option for consumers who are interested in this Android phone would be to pick up the new Galaxy S4 32GB model. This higher-capacity model went on sale in the U.S. today at AT&T stores and online. Of course, this does nothing to appease early adopters of Samsung's flagship smartphone, who are now stuck with an 9GB Galaxy S4 and a finite amount of apps.